I recently had the opportunity to sit down with the owner and president of valued Santa Cruz Kitchen & Bath vendor Colonial Bronze, Jamie Gregg, and learn what makes this industry maverick’s engine tick. Colonial Bronze is the oldest specialty home cabinet hardware company continuously manufactured in America. Spanning three generations, the company was founded in 1927 in the Bronx borough of New York City and has produced hand-finished hardware ever since. Its founders were two young brothers from Switzerland who immigrated to the United States in 1917. 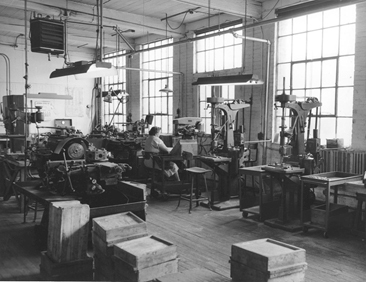 At first, the brothers had worked for the New Jersey-based hardware maker Standard Bronze. Seeing an opportunity to improve on the manufacturing process, they decided to launch their own company in 1927 in the Bronx, where Colonial Bronze remained until 1930. In the early part of the twentieth century, 85% of all brass produced in the United States was made along a 40-mile stretch of the Naugatuck River in Connecticut. Seeing an advantage to locating close to their raw materials suppliers, the brothers relocated from New York to the industrial town of Torrington, CT, in 1930. True to its Northeast roots, the company’s operations remain on the same site to this day. Since its inception as a roughly 5,000 square-foot facility in 1930, the operation has expanded several times and now occupies 45,000 square feet of space, a nine-fold increase in size. Through the tumultuous 1930s and 1940s Colonial Bronze adapted and innovated with the times and even produced proximity bomb fuses for the military in America’s WWII war effort! Jamie himself is the third-generation family owner of the company. Jamie’s father James Gregg, a World War II pilot from Hoboken, NJ, started working at the company in 1953 as an electroplater. He eventually moved into a sales position, rose in the ranks of management, and married into the founding family. In 1972, he bought the company from his father-in-law and his wife’s uncle. Growing up with his father in the family business gave Jamie deep knowledge of the internal workings of the company. Given the track record of passing both ownership and management responsibility within the family, it would have seemed like a good bet that Jamie would go directly into the family business. However, Jamie felt the desire to spread his wings. Instead he went to law school and began working as an associate in a New York City law firm in the early 1980s and later went on to become an Assistant US Attorney in Manhattan. The epiphany that he truly wanted to work in his family’s business came in 1983. Jamie vividly remembers the Sunday afternoon during which he was working feverishly on a 65-page legal brief for the following morning when his father called. His father realized he needed to expand his management team in response to Colonial’s growth over the years and asked his son if he had any interest in coming back. Jamie was then a newly married man. One of his great desires was to have a family and be deeply involved with his kids’ lives. As he looked around his New York office that Sunday, he realized that his current career track would take him in an entirely different direction. Although he knew that working at Colonial Bronze would be challenging, he remembered that his father would always come home for lunch when he was a child. Returning would afford him both a stimulating career and the flexibility to be active in his family’s life. Today he runs the company with his wife Joanne. After joining the company in 1983, things went well for several years. But the winds of global economic change were already blowing. The first wave of significant outsourcing to China in the late 1980s drove a fundamental change in market strategy for Colonial Bronze. In an all-too-familiar story to American manufacturers of that era, imported finished product started arriving from Asia’s low-cost countries at 3 to 4 cents over Colonial’s raw-materials cost. At that point, Jamie and his father knew they had to do something to set themselves apart. Noting that the mass-produced goods from overseas had very limited options—especially in terms of finish—they decided to diversify finish options, going from 14 choices in 1988 to 40+ by the end of 1989. By doing what other companies in their industry were unwilling or unable to do, Colonial Bronze held fast as virtually all their American competitors shipped operations overseas. In the ever-evolving battle against low-cost foreign competition, innovation is a required survival skill. Again choosing to develop capabilities to do things their competitors could not, Jamie and his father changed production methods to allow mass customization of products—an impossibility for imported goods shipped on long voyages in overseas containers. Given the trend toward mass customization, Colonial positioned itself to take advantage as Jamie took over the company’s reins from his father in 1993. It is a point of pride for Colonial Bronze and for Jamie that they continue making 95% of their product and finishing 100% of their product in their Connecticut facility. A fierce commitment to product quality drives Jamie’s desire—and that of the entire management team at Colonial Bronze—to continue operating that way. It has also driven their choice of production methods. Having shifted to exclusive use of CNC technology, Colonial Bronze can now produce custom-ordered items in single-unit quantities. As Jamie drives the culture of innovation and growth within Colonial Bronze, making certain that all the moving pieces of design and production run smoothly is Joanne, Jamie’s wife, who brings order to the chaos and balance to the creative processes that roam feverishly across the factory floor. The Ying to his Yang, Joanne is a stabilizing force in Jamie’s whirlwind of creative ideas. Ideas that fuel Colonial Bronze with new opportunities require planning and structure. It is Joanne’s fastidious attention to the details of the daily operations that provides management process inside this dynamic company. “Joanne definitely puts the structure into the management team within our company,” says Jamie. Jamie and his team continue to innovate seeking new, beautiful and interesting products to bring to market. In recent years, this includes exploring the use of other materials not commonly seen in knobs and pulls. Experiments and networking with various raw-materials vendors has created unique shapes as well as the use of leather-wrapped handles that give an elegant touch of class to any room in which they are installed. This Tanner’s Craft Luxury brand of leather-wrapped handles is an award winning series and is a prime example of how Colonial Bronze continues to push the envelope with new and exciting designs not found elsewhere in the decorative home hardware marketplace. This difference has not been lost on the interior design industry either as Colonial Bronze has won “Best Of Industry Awards” for innovative products 4 times in the last 20 years – and twice within the past six years! After 32 years at Colonial Bronze, Jamie’s drive to innovate in the areas of both process and product has not waned in the slightest. So, what’s next for this quintessentially American company that has so boldly stayed the course of manufacturing at home? Jamie wouldn’t disclose any specific plans at this point, but indicated interesting developments are in the works. At Santa Cruz Kitchen & Bath and Salinas Valley Kitchen & Bath, we are very proud to be a Colonial Bronze partner and look forward to sharing these new developments as they unfold.